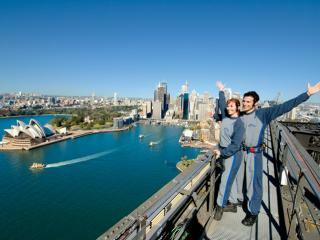 One of the most iconic ways to see Sydney, the Bridgeclimb allows you to climb over 1500m of the Sydney Harbour Bridge's famous steel frame. Boasting panoramic views of Sydney, the Bridgeclimb offers sunrise, sunset, day and night climbs providing the best views in the city from the world renowned landmark. A stunning way to explore the famous harbour, these relaxing sightseeing cruises take in some of Sydney's most popular attractions from a relaxed location on the water. Cruise through Darling Harbour and Circular Quay and enjoy spectacular views of the city skyline, Fort Denison, the Harbour Bridge and Sydney Opera House. These cruises offer spectacular harbour views that no restaurant can match, serving delicious lunch, sunset or dinner cruises aboard deluxe vessels. Many with the option of taking in a show, these cruises boast spectacular continuous views and a unique way to enjoy a meal in the famed Harbour City. With so much to see and do in Sydney, these sightseeing tours offer a careful selection of the best and most popular activities, attractions and destinations. From the historical significance of The Rocks to beautiful Darling Harbour and iconic Bondi Beach, these tours are the easiest way to enjoy the best of Sydney. Just a couple of hours to Sydney's north west, the Hunter Valley offers lush hinterland and some of Australia's best vineyards. The wine growing region is also renowned for its stunning landscape, gourmet dining options and the Southern Hemisphere's largest rose garden, all of which can be enjoyed with these tasting tours. Offering a unique blend of rainforest and canyons, the Blue Mountains boasts an amazing landscape filled with a wide range of natural bushland, beauty and nature-based attractions including the Three Sisters, Hanging Rock, Jenolan Caves, Anvil Rock, Grand Arch, Twin Falls, Grose Valley and the Skyway Cable Cars. Renowned as the point where the sea meets the country, Port Stephens is a charming coastal town just 2 and a half hours from Sydney. Home to a historical lighthouse, the area also boasts stunning beaches and nature and adventure based pursuits such as whale watching, scuba diving and sand tobogganing. Enjoy Sydney's sparkling Harbour and famous landmarks and attractions from a unique perspective in the air with these scenic hot air balloon or helicopter flights. Watch as the city skyline morphs into spectacular beaches and coves or float above the hinterland and historic Macarthur before enjoying a champagne breakfast.